Chartism Day takes place in the Armstrong Building of Newcastle University on Saturday 1 June 2019. All are welcome, but please register by Friday 24 May. Here are the programme and booking details. In 1867, the Liberal MP John Stuart Mill moved an amendment to the Reform Bill which would have given the vote in parliamentary elections to women. It was defeated by 196 votes to 73. But while politicians continued to resist women’s suffrage for a further half century or more, they were clearly happy to call on women’s help in getting elected provided that they confined themselves to cheer-leading on behalf of male parliamentary candidates. The year of the second Chartist petition was one of frantic activity for the whole Chartist movement. Between the start of 1842 and the beginning of May, when the petition was presented, activists up and down the country collected an enormous 3,315,752 names. At more than six miles long, the petition could only be taken into the House of Commons by removing the doors. Britannia and liberty: a message of hope for the Chartists? Commemorative medals or medallions were commonly issued throughout the 19th century to mark great radical causes and events. The 1832 Reform Act in particular produced medallions in a wide variety of styles and designs, as did Gladstone’s Reform Act of 1889. However, there appear to be relatively few relating to Chartism. I am no numismatist, but I was only previously aware of the two Feargus O’Connor medallions – one marking the launch of his Northern Union in 1838, and the other celebrating his release from gaol in 1841. However, I recently came across this more generic example dated 1842, which is clearly intended to mark the defeat of Chartism in 1842, following rejection of the second great petition for the Charter and the arrest of numerous local and national Chartist leaders. The question is, what message does it send? I bought this on eBay from a US dealer who described it as “Anti-Chartist”. But I’m not so sure. 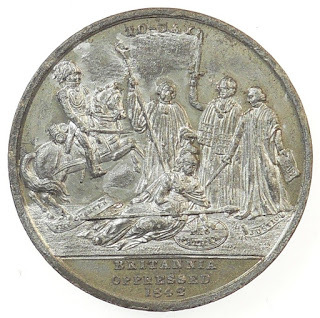 On the obverse, under the heading “To-day”, Britannia lies prostrate on the floor. To one side, a mounted cavalry officer, sabre drawn, tramples a banner marked “The Charter”. To the other, a bishop with his crook and what appear to be two robed judges armed with swords, one of whom holds a scroll engraved “Law”, tread a banner marked “Liberty”. 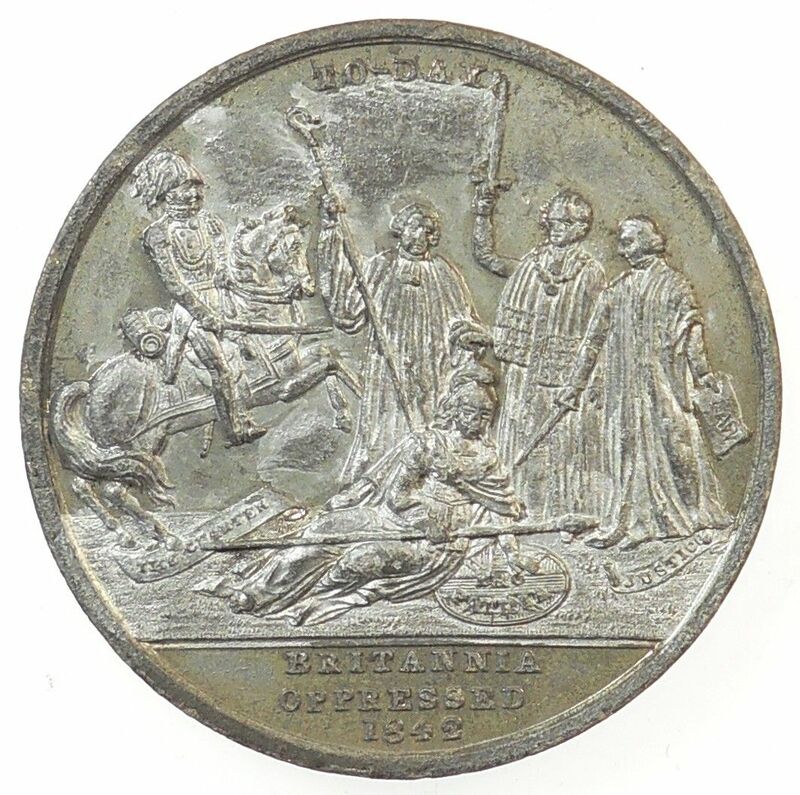 At the bottom of the coin are the words “Britannia oppressed 1842”. 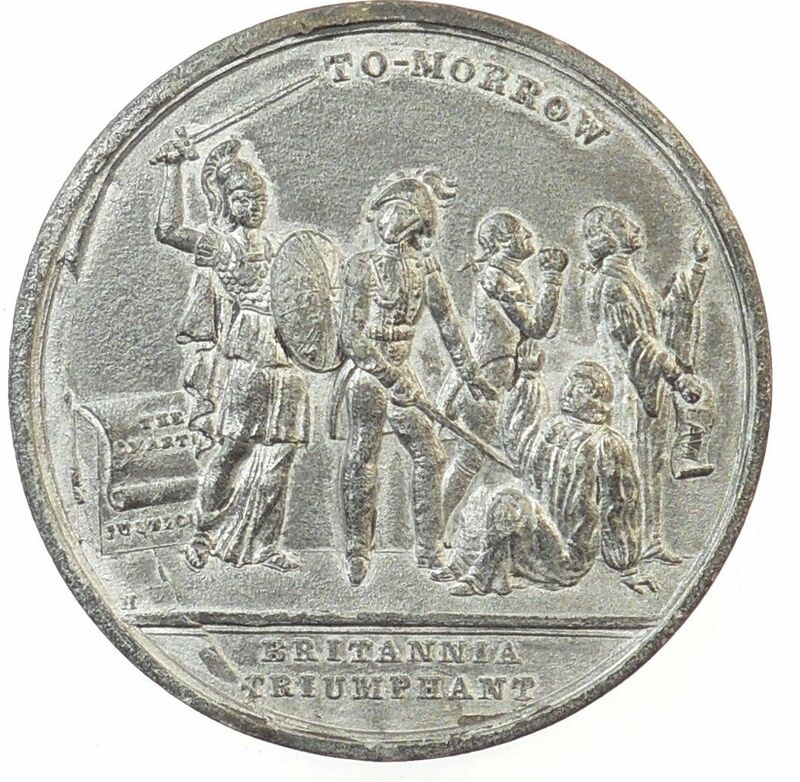 On the reverse, under the heading “To-morrow”, Britannia is triumphant, standing sword in hand in front of a scroll marked “The Charter”, which in turn lies across a box or stand inscribed with “Justice”. She is assisted by an armed man who holds the defeated bishop at sword point, while the judges flee, apparently praying for deliverance. The inscription at the bottom reads “Britannia triumphant”. I think these images, taken as a pair, can only be read as anti-Chartist if Britannia is associated with the forces of reaction and the state. Why else look forward to a day when she triumphs? But even then, the roles played by the cavalryman, bishop and judges simply don’t fit the narrative. But Britannia was never a purely conservative figure. Rather, she was associated with liberty, and appealed symbolically to the radical cause (not least as a British counterpart to the revolutionary French Marianne). 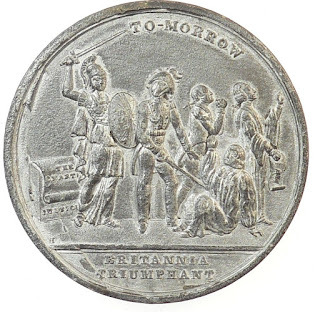 On this reading, Britannia is the people – or, more abstractly, the people’s liberty – oppressed “to-day” by church and state, but certain to overcome her oppressors “to-morrow”. In other words, the medallion is not anti-Chartist; rather, it offers a message of hope for the temporarily defeated Chartist movement in 1842 – victory will come. A free, searchable and browsable online version of the Northern Star newspaper is back online. This is great news for family historians and others without easy access to university libraries or paid-for digital newspaper websites. Launched in 1837, a little in advance of the first publication of the People’s Charter, the Northern Star played a central role in organising, informing and spreading the culture of Chartism among a mass audience – not to mention cementing the position of Feargus O’Connor as the movement’s leading figure. It continued in one form or another until 1852. The Nineteenth Century Serials Edition project launched a decade ago and gave access to the Star and to half a dozen other publications, but over time and as technology moved on it ceased to work properly. Clearly much has changed since the project first went live in 2018, so I strongly suggest reading these reflections on compiling a 10-year update to the NCSE. Even if you do have access to an alternative digitised version do take a look at the NCSE site – not least for the article about the history of the paper and its reproduction of the portrait prints distributed to readers of the Star over its first 10 years of publication. Personally, I still find the British Newspaper Archive version of the Star easier to use, but this may well be a matter of familiarity and individual preference, and I am certainly not going to complain that the NCSE takes a different approach. Congratulations and a huge thank-you to all involved. Was the 1842 Chartist petition really six miles long? Hello and welcome to the Chartist Ancestors blog. My name is Mark Crail, and I set up Chartist Ancestors back in 2003. I have been building it up ever since with the help of many very kind individuals who have provided both information and advice. This blog aims to highlight new additions to the site and developments in the wider world of Chartist studies. I hope you find it and the main site both informative and enjoyable. NB. The content of this blog was migrated from an earlier platform in March 2012, so anything dated up to and including 2 March 2012 on here was actually originally posted some months or years earlier. Copyright Mark Crail, 2012. Simple theme. Powered by Blogger.